A cloud-based solution for analyzing and visualizing athletic training data on mobile devices has won this year’s European Satellite Navigation Competition (ESNC). 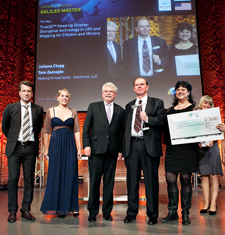 Kinexon GmbH and its cofounders, Oliver Trinchera and Alexander Hüttenbrink, received the “Galileo Master” award in the annual global event, which drew more than 400 other entries from nearly 50 countries. The results were announced today (November 5, 2013) as part of the European Space Solutions conference. Online analysis of athletes’ tactical, technical, and physical capability is playing an increasingly important role in modern sport training. Following this principle, Trinchera and Hüttenbrink, research assistants from Technische Universität München (Germany) founded the company at the European Space Agency (ESA) Business Incubation Centre Bavaria and developed a cloud-based solution for analyzing and visualising training data on mobile devices. The solution equips athletes with a small, portable location sensor and feeds the resulting data into the cloud by means of a stationary base antenna. This enables users to track and analyze various performance parameters and tactical movements down to centimeter level — all in real time. The solution’s user-friendliness during training and relatively low cost (compared to the camera-based systems commonly seen today) persuaded the international jury of experts who judged the competition. Until now, the high price of such systems has limited their use to professional sport; Kinexon’s system will enable coaches and amateur clubs to benefit from adding online analysis to their training activities. Along with the sport sector, this Kinexon system, the first version of which is set for market launch in this month, also could potentially tap into other markets, including healthcare, logistics, and unmanned aerial vehicles (UAVs), according to its inventors. “We’re pleased to be supporting Kinexon at ESA BIC Bavaria,” said Thorsten Rudolph, CEO of Anwendungszentrum GmbH Oberpfaffenhofen, which organizes the ESNC and supports the ESA BIC. Gerd Gruppe, a member of the German Aerospace Center (DLR)Executive Board, awarded the €20,000 (US$26,945) grand prize to Kinexon. This year marked the 10th in which the ESNC has recognized the best products, services, and innovations that encourage the use of satellite navigation in everyday life. At the 2013 awards ceremony, prizes worth a total of about €1 million were presented in 32 categories. Over the past 10 years, the competition has evolved into the largest innovation network for GNSS. It has selected 204 winners from a total of 2,397 ideas submitted by 8,200 participants. Today, more than 130 research and industry partners support ESNC entrants in realizing their business models. With 40 incubation centres in 17 countries — including regional facilities, the eight ESA Business Incubation Centres, and ESINET — the ESNC also comprises the largest space-related incubation network designed to promote start-ups and the foundation of new companies. 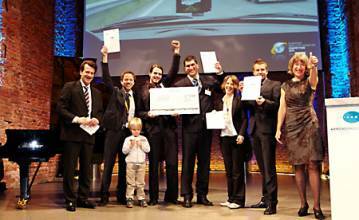 In addition to the overall winner — the Galileo Master — the 10th European Satellite Navigation Competition (ESNC) rewarded Special Prizes in seven different categories and 25 prizes to regional winners.